Cairo is Africa’s largest city with nearly 20 million inhabitants. Crammed with history and ancient artefacts, Cairo is a busy and congested city where new developments expand the city further into the surrounding desert. 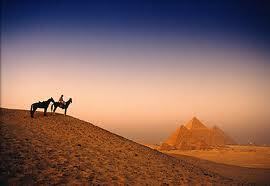 Close to Cairo are the famous Pyramids of Giza which are over 4000 years old. These huge tombs built by thousands of workers are truly incredible with their awesome geometry and huge size. Also on the Giza plateau is the great Sphinx with the body of a lion and the head of a King – this amazing sandstone monument dates back to 2500BC and is carved out of a single seam of stone. One of the world's most historic cities, there is a great choice of airlines which fly into Cairo including Swiss, KLM and Emirates. If you prefer to travel on direct flights then national carrier EgyptAir, BMI and British Airways all offer direct services from the UK. A must-see for any visitor to Cairo is the wonderful Egyptian Museum which is literally crammed full with ancient Egyptian treasures. 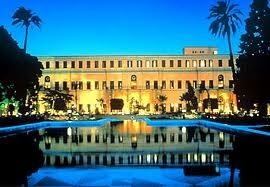 There is so much to see it may be even worth making several visits so you can take in the vast number of exhibits. One of the highlights of the museum is the Tutankhamun exhibition with his death mask of solid gold on display. Other exhibits in the museum include the Royal Mummy Room, the exquisite treasures from the New Kingdom tombs and the enormous statue of Khafre. Cairo is also home to some fascinating Islamic architecture and there are many superb tombs, temples and monuments to visit throughout the city. Try your hand at some bartering in one of the huge bazaars or relax in one of the many coffee houses and watch the world go by. Often low cost flights can be found if you travel on indirect flights with a transit or plane change on the way. To find the best deals on cheap flights to Cairo, Egypt, simply complete our flight search box and click to have the most competitive airfares at your fingertips. We recommend you book in advance for the cheapest flights to Cairo, however with airlines releasing offers throughout the year there are always great deals to be had on lastminute flights too. In Cairo, and along the Nile River Valley, the climate is a desert climate, but often with high humidity due to the river valley's effects. Wind storms can be frequent, bringing Saharan dust into the city during the months of March and April. High temperatures in winter range from 13 °C (55 °F) to 19 °C (66 °F), while night-time lows drop to below 8 °C (46 °F), often to 5 °C (41 °F). In summer, the highs rarely surpass 40 °C (104 °F), and lows drop to about 20 °C (68 °F). Rainfall is sparse, but sudden showers do cause harsh flooding. In New Cairo, a place of higher elevation than down town Cairo, the temperatures often drop below zero during winter causing morning frost.